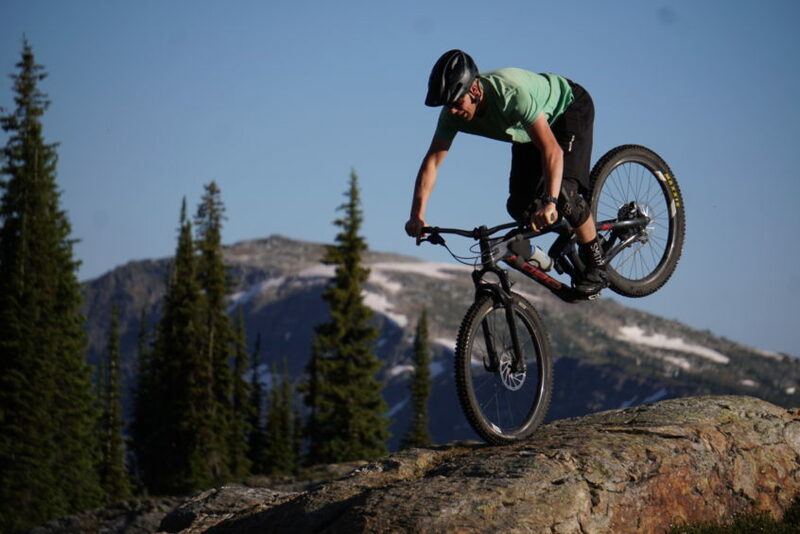 Mountain Biking: In the Mountains | Backcountry Lodges of B.C. Mountain Biking: In the Mountains | Backcountry Lodges of B.C. Mountain biking should take place in well, the mountains, and there’s something special about sharing that experience with friends and family. Unique vistas, with layers of unadulterated peaks definitely will help you put down that phone and capture real moments in time. True Mountain biking has long been a coveted experience for the sports elitist. What I mean by this is that, as a rider you used to flip over a magazine cover and dream of being that pro, somewhere high in the mountains, exploring alpine terrain and returning to a remote lodge with scrumptious food, tasty beverages and clean, crisp sheets. These trails were often hard to find, local secrets, that took a massive amount of fitness to explore. Over the last 5 years, this scene has changed, from heli-biking to the growth of easily accessible alpine single-track, and here in Beautiful British Columbia, we’re leading the charge. The Backcountry Lodges of BC Association has a number of lodges that provide quick and easy access to the alpine, true mountainside access, all situated around riding hand-built single-track. In this article we’ll be highlighting Sol Mountain Lodge throughout our imagery and point-of-view video footage. Sol Mountain Lodge is a family friendly lodge that you can drive to! Albeit the road is suitable only for 4×4 vehicles with favourable ground clearance. Be forewarned, it definitely feels like cheating when you open your car door and set your eyes on the immaculate lodge. Since this article is mainly about the trails, I’ll skip all the general info (you can view it on their website) and cut to the goods! Sol Mountain Lodge is a family run business, this means all hands on-deck, all-the-time! The trails here are built with the utmost care for the environment and even more impressive is that lodge owner Aaron Cooperman, has his teenage son, Seth, working full-time, hand clearing, and hand laying rocks for your riding pleasure. Seth is also an absolute shredder, so if you’re up at the lodge and he’s done working for the day, be sure to ask him to go for a pedal. I first heard about the trails at Sol Mountain Lodge from Seth, he’s a young junior racer in my event series (the Canadian National Enduro Series), when he told me about the steep rock rolls, expansive views and technical climbs, I was hooked! One thing to be weary of here at Sol, is that it takes almost double the riding time to get anywhere, the reason, the views. It took us almost three hours to ride fifteen kilometers as we couldn’t help but stop at every opportunity to bask in the humbling glory and serenity of the alpine. The best time for a ride, is right now, go early in the morning or late in the evening for the best light, and it’s best to book a few nights at the lodge so you can ensure that you get those Instagram shots, you’ll want to ride and re-ride the trails to claim your favourites. Alpine trails are unique, and although the map shows many blue square trails, there are a few black diamond moves and a wee-bit of an exposure to keep you honest. Why not bring the whole family for some alpine fun in the sun!? This area boasts lots to do from hiking, biking to simply hanging out at this premier lodge, there’s something for everyone. A massive thanks to Seth Cooperman (the son) and Aaron Cooperman for showing us around the trails. I don’t want to give all their stories away, but be sure to leave a donation at the trailhead, you’ll find a pleasant surprise for you at the lake! BMFF 2018, Hope to see you there!